Text: Origins. This hymn of harvest and thanksgiving was written by William Chatterton Dix (1837–1898) and first published in the enlarged edition of Hymns for the Services of the Church (Bristol: H.W. Drake, 1864 | Fig. 1) (“St. 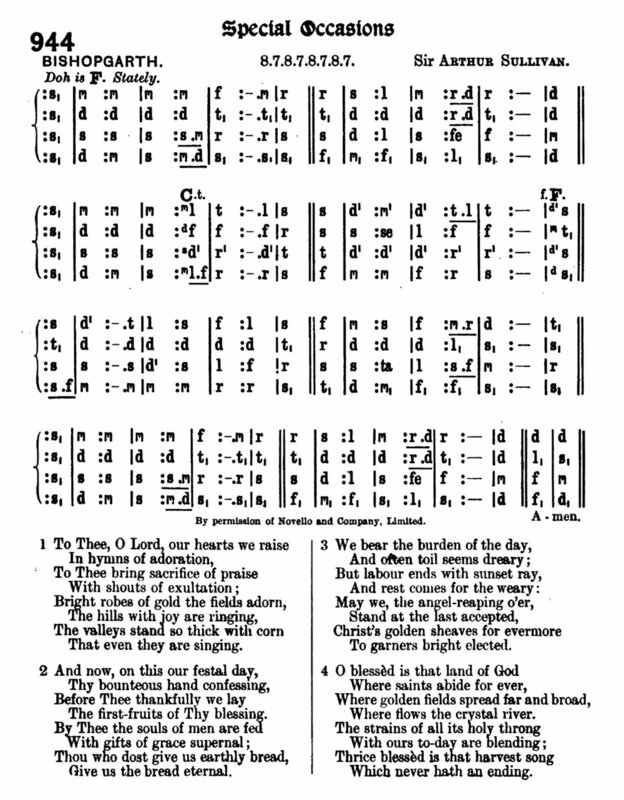 Raphael’s Hymnal”), a collection published for the Bristol congregation where Dix was a member. The original text was in four stanzas of eight lines, without music. Fig. 1. Hymns for the Services of the Church (Bristol: H.W. Drake, 1864). Text: Analysis. This hymn is rich with language for the autumn harvest: “robes of gold the fields adorn,” “the valleys stand so thick with corn,” “golden sheaves,” “golden fields,” and “harvest song.” The text also moves from the physical to the spiritual, expressing in stanza two the feeding of souls by gifts of grace, in stanza three the harvest of souls, and in stanza four an eternal, heavenly song. Scriptural allusions include the “daily bread” of the Lord’s Prayer, the bread of life found in John 6:35, possibly the parable of the laborers in the vineyard from Matthew 20, and the crystal river of Revelation 22:1. Tune 1. The most common tune setting for this text is GOLDEN SHEAVES by Arthur Sullivan (1842–1900), written for his collection Church Hymns with Tunes (1874 | Fig. 2), where it was paired with Dix’s text and named after a phrase in the third stanza. Fig. 2. Arthur Sullivan, Church Hymns with Tunes (1874). Tune 2. The next most common tune is also by Arthur Sullivan, BISHOPGARTH, written for a text by William Walsham How, “O King of kings, whose reign of old,” and first published in a booklet for the Diamond Jubilee of Queen Victoria, Hymn … to be used in all churches and chapels in England and Wales, and in the town of Berwick-upon-Tweed upon Sunday the twentieth day of June 1897 (London: Eyre and Spottiswoode, 1897 | Fig. 3). Fig. 3. Hymn … to be used in all churches and chapels in England and Wales (London: Eyre and Spottiswoode, 1897). 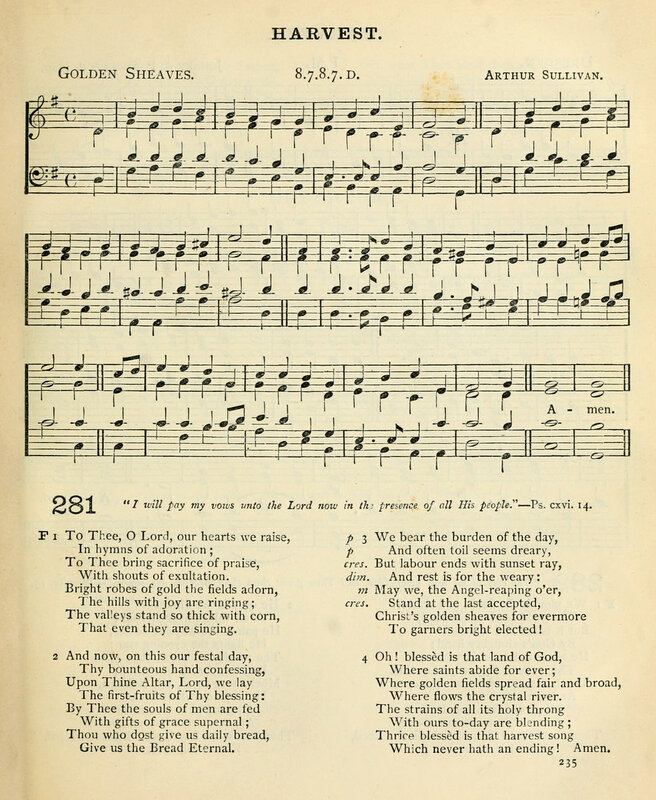 Sullivan’s tune and Dix’s harvest hymn were paired together as early as 1904 in the Methodist Hymn Book with Tunes (Fig. 4), shown here in a Tonic Sol-Fa edition, a practice that was en vogue at the time. Fig. 4. Methodist Hymn Book with Tunes, ed. Frederick Bridge (London: Wesleyan Conference, 1904). “To Thee, O Lord, our hearts we raise,” Companion to Hymns and Psalms, ed. Richard Watson & Kenneth Trickett (Peterborough: Methodist Publishing House, 1988), p. 230.